Skimmia japonica, a landscape cultivar - this image illustrates fruit of the female plant and the reduced floral cluster of male plants. 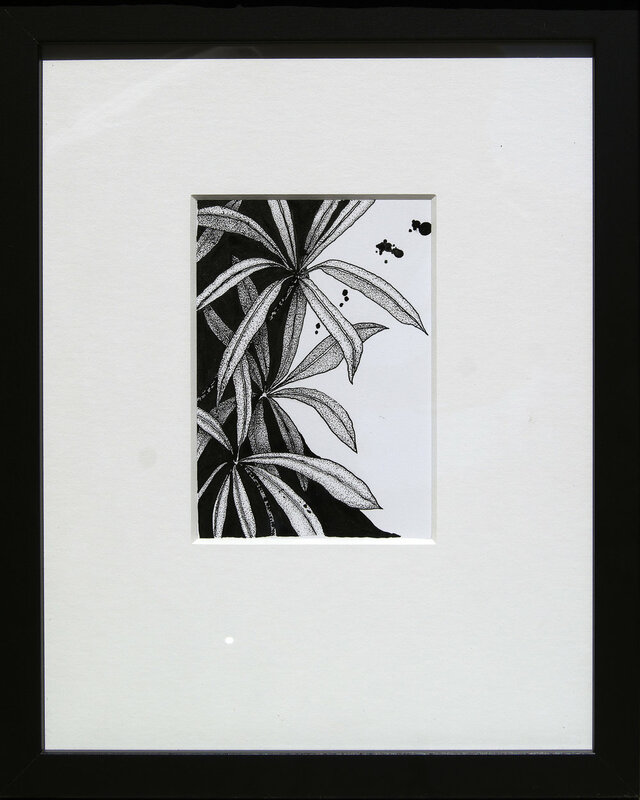 A 5" x 7" pen-and-India ink drawing in 11" x 14" matted wood & glass frame with acid-free Bristol vellum and mat. Helix hedera, an invasive species on coastal cliffs of the Pacific Northwest. 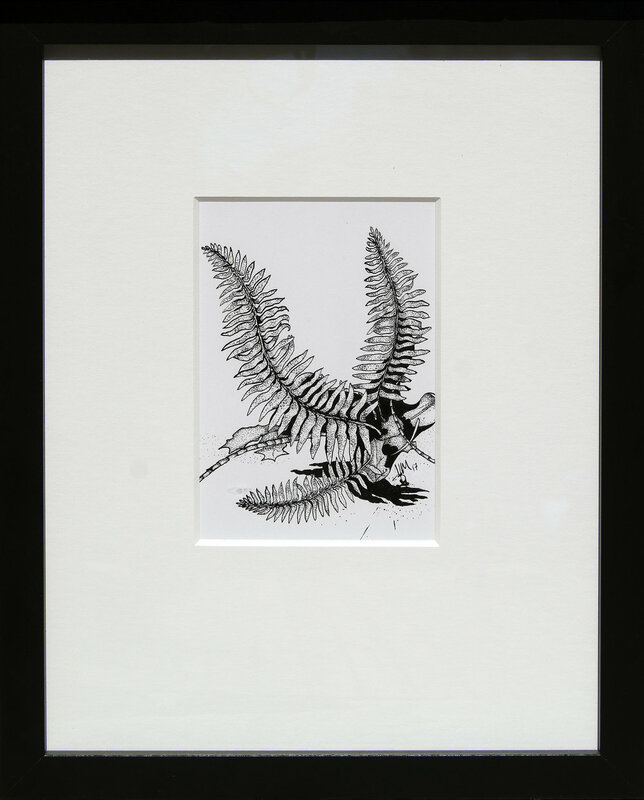 A 5" x 7" pen-and-India ink drawing in 11" x 14" matted wood & glass frame with acid-free Bristol vellum and mat. Schefflera sp. & Dryopteris sp., a landscape cultivar over-wintering on the Hood Canal of Washington state - this image showcases the compound leaves of Schefflera against a backdrop of wood fern (Dryopteris sp.). A 5" x 7" pen-and-India ink drawing in 11" x 14" matted wood & glass frame with acid-free Bristol vellum and mat. Schefflera sp., a landscape cultivar over-wintering on the Hood Canal of Washington state - this image celebrates the beauty of imperfection - from the scrawny leaves of a plant that has survived the storms of winter to the yin and yang of Ink against white negative space. A 5" x 7" pen-and-India ink drawing in 11" x 14" matted wood & glass frame with acid-free Bristol vellum and mat. Polypodium scouleri - leathery polypody, leather-fern, or coastal polypody, this hardy fern weathers the coastal winters of the Pacific Northwest well, but struggles to fight its way to the sun through the strangling overgrowth of invasive English Ivy. A 5" x 7" pen-and-India ink drawing in 11" x 14" matted wood & glass frame with acid-free Bristol vellum and mat. "Adirondack" - Weather during late February on Washington state's Hood Canal often fluctuates between rain, snow, and shine - here a row of Adirondack chairs sit empty and waiting at the Alderbrook Resort & Spa, heralding the spring to come. A 5" x 7" pen-and-India ink drawing in 11" x 14" matted wood & glass frame with acid-free Bristol vellum and mat. Polypodium scouleri - this leathery fern competes for survival on the cliffs of the Olympic Peninsula of Washington state. The invasive English Ivy (Helix hedera), though beautiful, is strangling native species all along the northern Pacific coast. A 5" x 7" pen-and-India ink drawing in 11" x 14" matted wood & glass frame with acid-free Bristol vellum and mat. Polystichum munitum - The hardy sword fern is an abundant undergrowth plant in the Western Red Cedar forests of coastal Washington state. Though weather-beaten and aging, the over-wintering form of this fern never loses its grace. A 5" x 7" pen-and-India ink drawing in 11" x 14" matted wood & glass frame with acid-free Bristol vellum and mat. Polystichum munitum frond - Sword fern of the Hood Canal and Olympic Peninsula, PNW - February 2017. This winter-beaten frond shows its resiliency and aging grace. 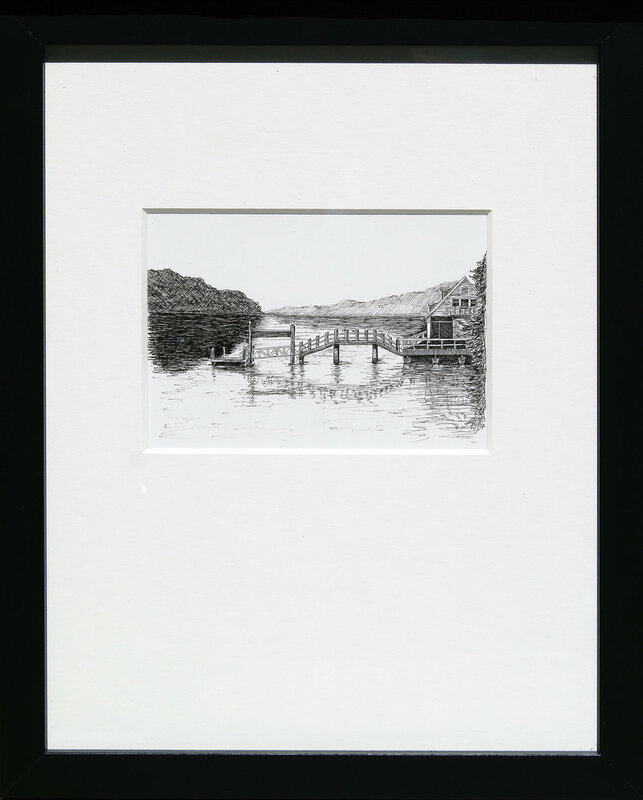 A 5" x 7" pen-and-India ink drawing in matted 11" x 14" wood & glass frame with acid-free Bristol vellum and mat. Polystichum munitum - This image emphasizes the graceful curve of the sword fern frond. The sword fern is an important understory plant of the Cedar and Douglas fir forests of the Pacific coast. 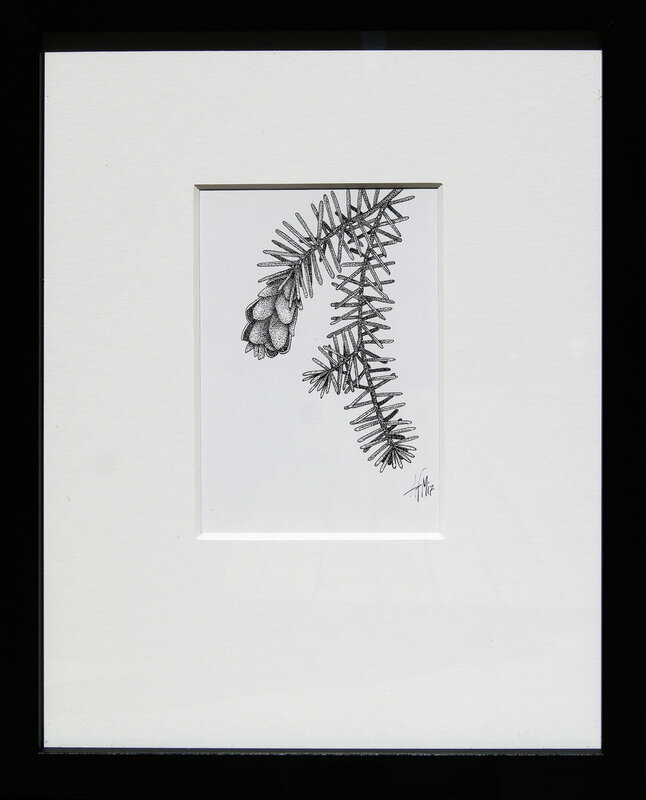 A 5" x 7" pen-and-India ink drawing in matted 11" x 14" wood & glass frame with acid-free Bristol vellum and mat. Dryopteris sp. pinna - pinna (smallest frond division) of a wood fern. 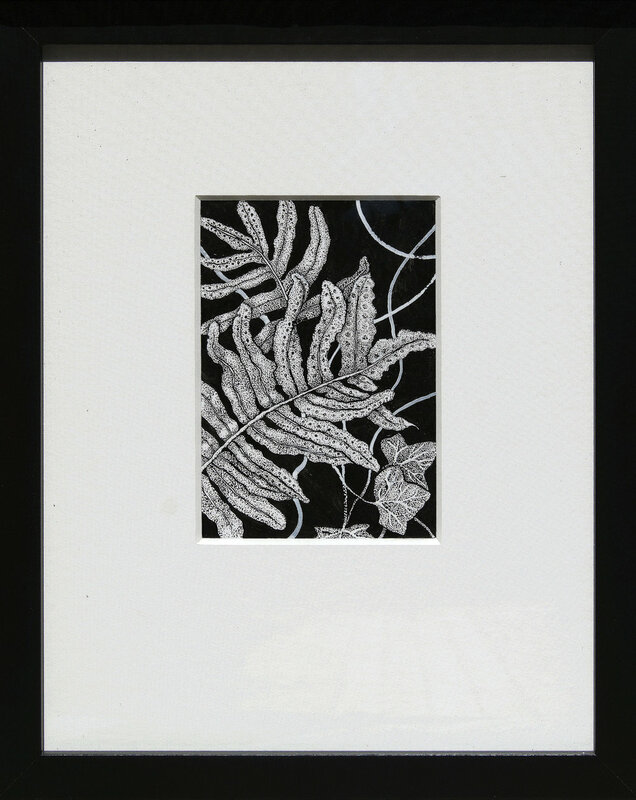 A 5" x 7" pen-and-India ink drawing in 11" x 14" matted wood & glass frame with acid-free Bristol vellum and mat. Pseudotsuga menziesii - Douglas fir. 'Doug' fir is common to the Pacific coastal forests from northern California to British Columbia. A 5" x 7" pen-and-India ink drawing in 11" x 14" matted wood & glass frame with acid-free Bristol vellum and mat. Pseudotsuga menziesii - Douglas fir. This image accents the edgy shadows of a rare bright day in the Olympic rainforest. A 5" x 7" pen-and-India ink drawing in 11" x 14" matted wood & glass frame with acid-free Bristol vellum and mat. 'Dock on the Hood Canal.' A study of reflections in ink. A 5" x 7" pen-and-India ink drawing in 11" x 14" matted wood & glass frame with acid-free Bristol vellum and mat. 'Beach-combing plover.' This little bird was nothing if not tenacious, foraging on the beach with a storm threatening on the horizon. Tsuga heterophylla - Western Hemlock, along with Sitka spruce (Picea stitchensis) are the most common trees found in the Hoe rainforest of Washington state. A 5" x 7" pen-and-India ink drawing in 11" x 14" matted wood & glass frame with acid-free Bristol vellum and mat.